I haven’t kept this fact a secret– ever since I became pregnant, I haven’t done much formal exercise. In my first trimester, exercise actually induced some of my morning sickness. Not one, not twice, but three times after I went for a walk with the husband, I ended up getting sick. I pretty much decided it wasn’t worth it to go for a walk if I felt awful immediately after. Then as I began my second tri, my SI joints, hips and legs started to hurt. . . a lot. As you may remember, I barely could walk and even consulted with a pain management specialist. Any attempt I did make to go for a walk failed for the most part, and even my one trip to the gym to try out the bike and elliptical hurt. 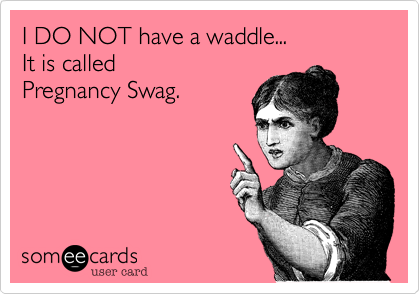 I definitely walked with a visible limp; those who knew I was pregnant thought it was a pregnancy waddle, but really it was caused by pain that I have experienced on and off for at least three years. I have to say, on the plus side, I haven’t felt any guilt over not exercising. If there is any time you should listen to your body, it is during pregnancy, that’s for sure. Also, I was slightly afraid that not exercising would mean weight gain at rapid speeds, but that hasn’t happened at all either. However, I always did envision myself being active during pregnancy, but I quickly came to terms with the reality of my situation. Well, now, at 21 weeks pregnant, I finally kind of feel like my old self again. My joint pain (knock on wood) has eased up quite a bit and I can actually walk without a limp! I have energy! All in all, I am eager to get out and move! So yesterday, for the first time in what felt like forever, I went to the gym. I did the elliptical for a whole hour, varying speeds and intensity. And I loved it! I also went to my first prenatal yoga class yesterday, and experienced 90 minutes of bliss. The movements were gentle, but I left feeling so mentally and physically satisfied. I was finally active, and I savored every minute of it! I know I can’t go overboard. As much as I want to go to the gym right now, I know my husband wants to go for a long walk later (he’s still asleep as I type this), so I am resisting my urge since I think two-a-days are a bad idea for me at this point! I also know that just as I feel good today, my pain can easily come back tomorrow. All I can say is I am taking it a day at a time, but I am quite happy that at least for the time being, exercise is back in my life! Have you ever taken a long break from exercise? How did you feel when you came back to it? One Response to "Sunday Snippit: I Was Active!"